Being a dystopian story in an oversaturated market is hard. It’s not that thinking of a bleak dystopian future is hard, that is actually really easy and keeps becoming easier as public opinion is progressively more jaded toward government. What is hard about being a dystopian is that because the market is oversaturated it is impossible to avoid comparisons. Pawn would have been great had it not reminded me of The Selection by Keira Cass (although more bleak), Tandem by Anna Jarzab (although the world building in Pawn wasn’t nearly as good), and The Testing by Joelle Charbonneau. The basic premise of Carter’s dystopia is that at 17 each teen is tested and given a roman numeral (I-VII) that they will carry for the rest of their lives and determines the kind of life they will have. When Kitty, the main character, is tested she receives a III which means a terrible life at the poverty level which she attempts to escape to stay with her boyfriend Benjy. Kitty was likeable and fun to read about. When Kitty was faced with difficult decisions I never knew exactly what she would choose but that was okay because Kitty’s opinions changed throughout the novel. She was a real person! Kitty underwent some great character development. She goes from a girl barely surviving to a reluctant member of a rebel movement. What I didn’t like was that other characters kept calling her spunky but I felt like I was told she was spunky rather then experiencing it. My other favorite character was Lennox Creed, or Knox as he would rather be called. Lennox Creed has the most badass name I have heard all year. Knox Creed would make a really excellent villain. In the story though he is more of a gray area character who you both want to trust and don’t really trust just because of who he is. The romance in this story was close to, but not really, a love triangle. Kitty is very serious about her boyfriend Benjy and spends a great deal of time thinking about and trying to protect him. I admired the fact that she was steadfast toward Benjy but at the same time because he got so little page time and there were no flash backs to them falling in love or doing cute things I didn’t care about Benjy. I had trouble caring if he lived or died because I wasn’t invested in his character. What set Pawn apart from other dystopians, and kept me reading, was all of the political intrigue and backstabbing. The Hart’s are the ruling family, the only people ranked VII in the nation, they are constantly trying to kill on another or plot a different member of the family’s downfall. I loved watching them be evil. Daxton, the current prime minister, is trying to kill his sister Celia who is trying to kill him because he had her daughter, Lila, killed. And all the while Augusta, the real leader of the nation, is pulling the strings. The only kind person in the entire family is Greyson, and he isn’t even interested in ruling. My Unsolicited Advice: With the second half of this book focusing greatly on the political aspect of the story Carter could have written this as high fantasy set in a different world rather then making it a dystopian (this would have been fairy easy to do too, just add a few more pages of description and re-name the cities). Being a dystopian this novel is just one in a sea of others. Had it been high fantasy the novel would have been something unique. 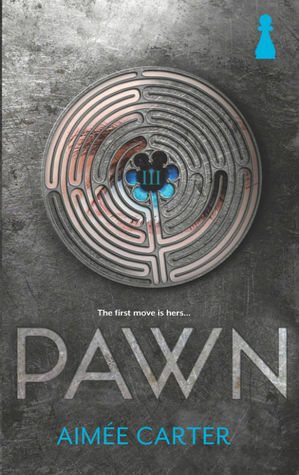 Overall, while Pawn did remind me of the plethora of other dystopian novels on the market I still enjoyed the story. The pacing was quick and the length was rather short so Pawn was a quick, exciting, read. Hm... I never thought of it, but you're right. This probably would've been really cool as a high fantasy series. Darn! I haven't read the other two dystopians you compared it to; but I have heard that. I actually liked the book as a whole-- but I wasn't able to really connect to any of the characters. It was more plot driven and it was difficult for me to care.